Four months ago in December, I registered my phone number in the Do Not Call (DNC) Registry in the naïve hope that I won't get any more spam on my phone. For a while after the registry came into effect on 2 January, it seemed to work. No more cold calls or SMSes from property agents and eczema cure salesmen. Then last Thursday, I received this spam SMS (below). I decided to make a complaint and found this webpage at www.pdpc.gov.sg. PDPC stands for Personal Data Protection Commission, the Government body running the DNC registry. Welcome back to Abbreviation Hell. The page title is "Lodge a Complaint of a Do Not Call Registry Offence". If you suspect that an organisation has breached the Do Not Call (DNC) provisions, you may wish to directly contact the organisation sending you the telemarketing message and request that they stop doing so. This is like the dumbest thing I've ever read. 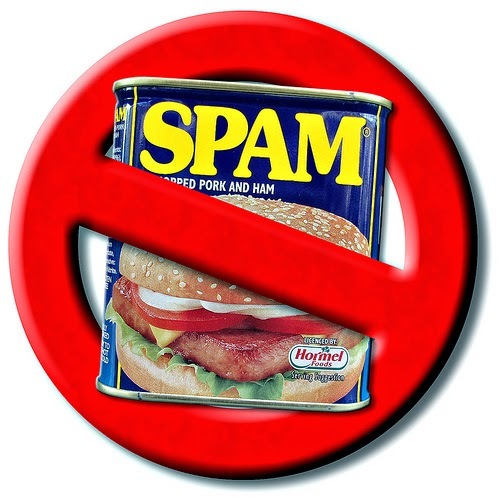 The last thing I want when I get spammed is to have any contact with the spammer. You may also wish to lodge a complaint with the Personal Data Protection Commission (PDPC). The following checklist is to assist you in assessing whether to make a complaint. Did the sender of the telemarketing call, text message or fax breach the DNC Registry provisions? 1. Was the telemarketing fax, text message or call sent to you within the first 60 days of adding your Singapore telephone number to the DNC Registry? 2. Have you previously given clear consent to the organisation to send you telemarketing calls, text messages or faxes, and that consent has not been withdrawn? 3. Is the message or call excluded from the scope of the DNC Registry provisions? For example, it would be excluded if it was sent by a public agency under, or to promote a programme carried out by that public agency which is not for a commercial purpose or solely to conduct market research or survey or for offering you an employment opportunity. 4. Is the call, text message or fax for Business-to-Business telemarketing? For example, is the telemarketer trying to sell corporate insurance to your company? 1. Do you have an ongoing relationship with the organisation sending the text message or fax? 2. Is the purpose of the fax or text message related to the subject of the ongoing relationship? 3. Have you withdrawn your consent, opted out more than 30 days ago through an opt out notice, or indicated to the sender that you do not consent for the sender to send you marketing text or fax messages? I just skipped to the part with the heading: How to Lodge a Complaint of a DNC Registry Offence. That was more helpful. Under the Moneylenders Act, licensed moneylenders are not allowed to advertise their moneylending services via SMS or voice calls. Therefore, any SMSes or calls soliciting for loans are either sent by a licensed moneylender in contravention of advertising restrictions, or by an unlicensed moneylender. It's as if they knew the spam I wanted to complain about would be from a moneylender. 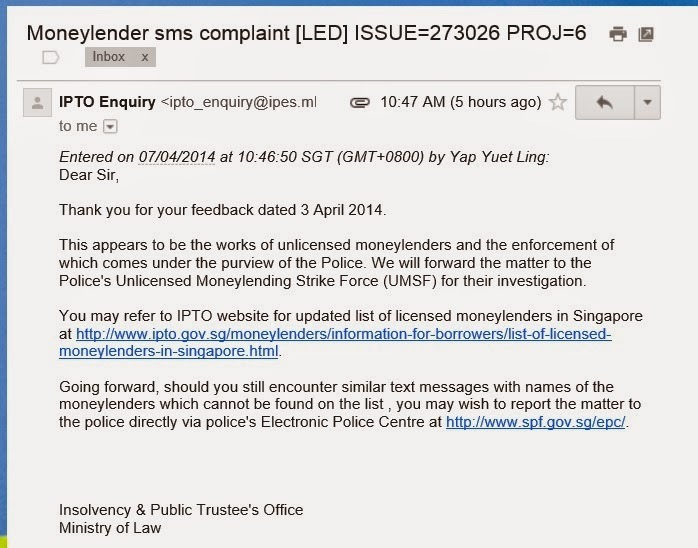 So I sent the screen cap of the SMS to ipto_enquiry@ipto.gov.sg, hoping for the best but expecting nothing. So I was surprised to receive this e-mail (below) from IPTO yesterday. So they're basically passing the buck to the police. From DNC to PDPC to IPTO to UMSF - have I welcomed you back to Abbreviation Hell yet? Or AH! The upshot is that the DNC Registry is pretty useless against moneylender spam. You have to make a police report. The irony is that I actually like Spam the meat. 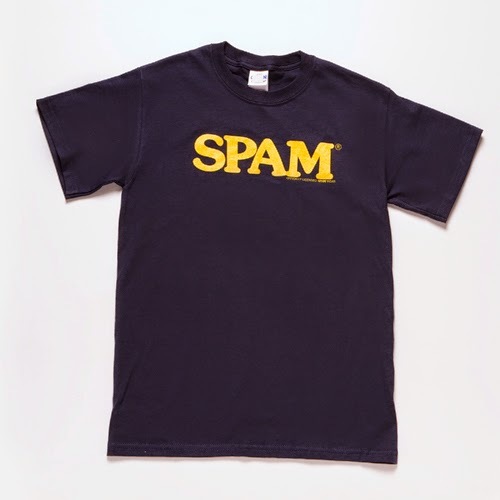 I'm so sad I lost my Spam T-shirt.